In the spirit of Halloween, I’ve dug up some spooky natural phenomena for you to consider while you rot you teeth out with hard-earned candy. Maybe “spooky” isn’t the best word, but these are still pretty fascinating–and aren’t likely to keep you up at night. There are over 90 cases of amphibians being found alive, yet totally encased in coal or stone geodes. These rocks are thousands of years old–are the frogs also that old? Typically, an extremely pale frog is found in a pool of mucous within the rock. When the rock is opened, and oxygen gets in, the toads come to life! In most cases it only survives for 24-72 hours before it dies. In some cases, if it gets to a pond immediately it can survive. I don’t know about you, but thousand-year-old frogs and toads are pretty freaky. 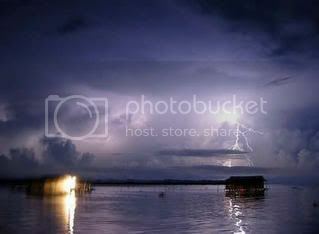 Off the coast of Venezuela, there is a lightning storm that never ends. Well…not never, exactly, but the phenomenon is a cloud-to-cloud lightning that forms a voltage arc more than five kilometers high during 140 to 160 nights a year, 10 hours a night, and as many as 280 times an hour. That’s a lot of lightning. The storm is also known as the Maracaibo Beacon, because sailors have used its light to navigate for ages. Twice a year, the Atlantic Ocean rolls into the mouth of the Amazon river in Brazil, creating the longest wave in the world. The phenomenon is known as Pororoca, and generates waves as tall as 12 feet that can last for a half hour. The wave is so loud that it can be heard up to 30 minutes away, and it destroys nearly everything in its path – trees, buildings, animals and the like. Despite the risk, adventure surfers flock to the Amazon to surf the wave. The record time spent on the wave is 37 minutes, for a total of 12.5 miles. Yes. This really happens. Every year in Honduras, between May and July, there is a massive storm that leaves the streets riddled with fish. The people of Honduras actually consider this a miracle, and scoop up the fish to cook and eat. Scientists have hypothesized that whirlwinds are responsible, in that they swirl up water and everything in it, carrying it over land and leaving a street full of scaled, floppy, tasty creatures. Legend has it that this has been happening for over a century, ever since a Catholic priest (Jose Manuel Subirana) asked for a miracle to solve the nation’s poverty. It’s the world’s loudest sound recorded underwater–and no one knows where it came from. This sound was first recorded in 1997, 1500 miles off the coast of Chile, and could be heard from over 3,000 miles away.The sound lasted for just over a minute and has not been detected since. It should be pointed out now that the NOAA has checked with the Navy and other groups to rule out human-made sources in this and the rest of these cases. What could it have been? Aliens? Foreign military demonstration? Freakishly huge animal? No one knows. This entry was posted in Featured, Holiday and tagged Eco-Facts, Environment, environmental impact, Halloween by Korey M. Bookmark the permalink.